Titan and Bella – C.S.P.C.A. I got these 2 dogs from the C.S.P.C.A. Titan is in the first picture he is a black Boxadour. I got him last year 18/03/11. 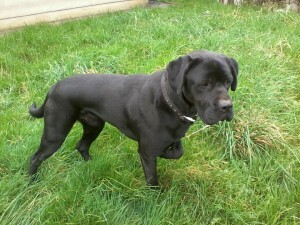 He was approx one year old when I got him, he got too big for his first owners and was a bit too giddy. With a bit of training, which he caught on to fast,he is a calm dog but still great fun. He gets on great with my other 2 dogs but I am still working on the cat! The kids love him he is a great addition to our family. If I was ever to get a dog in the future I would get one from the C.S.P.C.A. 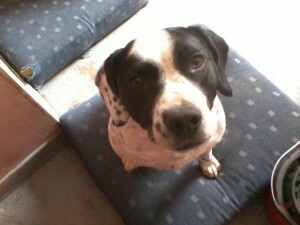 The second photo is of Bella, a Staff Pointer Cross. I got her on 3/09/08, she was a pup of 3 months old when i got her. Now going on 4 she is a great dog full of life and loves to play.